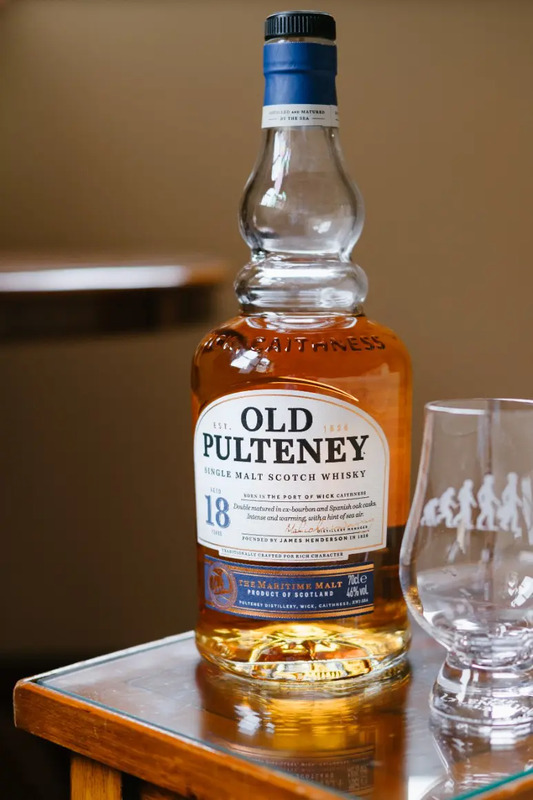 A few years ago I was told that Old Pulteney 12, the Highland single malt Scotch whisky, with a big sherry presence alongside sweet citrus fruit notes and a faint aroma of brine – represented the best value. Best value in terms of taste and price, and in the single malt Scotch whisky category. I won’t reveal my industry-insider source, but he inspired me to buy a bottle – a decision I’m pleased to have made. I’ve been a fan of this multiple-award winning whisky ever since. Regular readers of Ape to Gentleman may notice this post has been updated since last week. The reason being, Ape were asked to feature a teaser of the new, four-strong Old Pulteney single malt collection, prior to launch on 14/08. And have since attended the launch night of the new collection in London – a real pleasure, hosted at Dandelyan in the UK capital. All four of the new whiskies were sublime, truly. Please read on to learn more. Termed a “reinvigoration” of the core range, all four single malts are of course distilled and matured by the sea at Old Pulteney’s award-winning Caithness-based distillery, and complemented by distinctive new design and packaging. It’s a welcome evolution for the brand, with a renewed vigour while remaining true to the brands heritage and traditions. Rich in gold colour, Huddart (ABV 46%) celebrates the birthplace of Old Pulteney. A distinctively smoky take on its signature single malt scotch whiskies, Huddart is rich, warming and combines influence from the salt-infused sea air with peat smoke, delivering a mellow and smoky whisky with real character, depth and identity. RRP £45. A naturally rich, amber-coloured whisky, the 15 Years Old expression (ABV 46%) is Old Pulteney’s most balanced and smoothest single malt whisky. Bursting with aromas of rich dried fruit, ripe apples and citrus, with honey sweetness and a generous chord of creamy vanilla, 15 Years Old effortlessly brings together two different sides of the flavour spectrum. It happens to be my favourite – despite being gifted the 18 Years Old… I’m not complaining though. RRP £70. Completing the new portfolio, 18 Years Old (ABV 46%) takes its character and colour entirely from the American oak casks and Spanish sherry butts in which it has been nurtured, delivering a deep amber colour. This indulgent and deeply warming expression features notes of chocolate and spice, but allow for the influence of more vibrant, zesty flavours. RRP £115. Fortunately, they didn’t tamper with the original. Well, not the liquid within anyway – but the new collection is complemented with the addition of the repackaged flagship Old Pulteney 12 Years Old. Golden-coloured 12 Years Old expression (ABV 40%), as before, is a good place to begin with your Old Pulteney journey. It embodies the maritime malt characteristic that has become synonymous with Old Pulteney whiskies. Matured for 12 years in ex-bourbon casks, marrying together the salty flavours of the sea with the influence of American oak, to bring sweetness into play, and create a classic expression. RRP £32. The entire collection of four whiskies also has a handsome new design, which freshens up the overall look yet created around the existing, highly distinctive Old Pulteney bottle shape. One things’ for sure – a bottle of any of the above will look great in your whisky collection, and wow anyone you choose to taste it with. The collection is available now at The Whisky Exchange, The Whisky Shop, Royal Mile Whiskies, and Sutherland Brothers, thereafter, there will be a phased global roll out.